Green Hill is the eighth stage of Sonic Forces, and the second stage to be played by Classic Sonic. As the name implies, this stage is located in Green Hill Zone from Sonic the Hedgehog, but inspired from the version seen in Sonic Generations and with a new environment due to desertification process in this formerly tropical paradise caused by Dr. Eggman's industries. Lamenting that he failed Sonic when Infinite defeated him, but taking solace in knowing that another Sonic has arrived to fill out for him, Tails continues his hunt for Dr. Eggman alongside Classic Sonic so they can defeat the doctor for good and win the war, while also seeking out the secret to Eggman's new power so they can get Classic Sonic home. Their search takes them to Green Hill, where Tails guides Classic Sonic through the relatively undamaged landscape, although the sight of the area's new desert puzzles Tails. 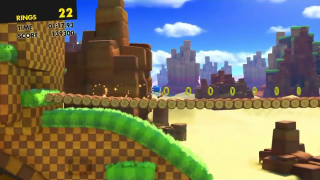 Green Hill begins similarly to its previous counterparts, but differences can be noticed early on, like hidden springs helping the player to cross platforms. Further ahead there is a bifurcation in the path where the player may choose to use an invisible spring to follow the upper path or fall to the lower path, both leading to a basic platforming section before a S-tunnel in a cavernous area leading to another bifurcation. The stage ends in a cinematic way with Choppers jumping on a bridge while it falls and then Classic Sonic reaches the signpost. As the first Classic Sonic stage shown in a trailer from Sega, fans on social media began criticizing the stage's presence in Sonic Forces as soon as it was revealed. Some claimed that the implementation of the stage in recent Sonic games has been kind of repetitive, especially after it was reintroduced in several modern games, particularly Sonic Generations and Sonic Mania.